With Jurassic World conquering box office records, dinosaurs are in again. And who hasn’t dreamt of having their very own terrible thunder lizard? As the new web series “We Have A Dinosaur” explores, that dream may not be so great when it meets reality. Especially around breakfast time. As conceived by Quinton Kappel, directed by Evan Richards, and with animation by Joanna Lee of Brickyard FX, “We Have A Dinosaur” shows different downsides of owning a Velociraptor than merely possible evisceration or clean-up duty. 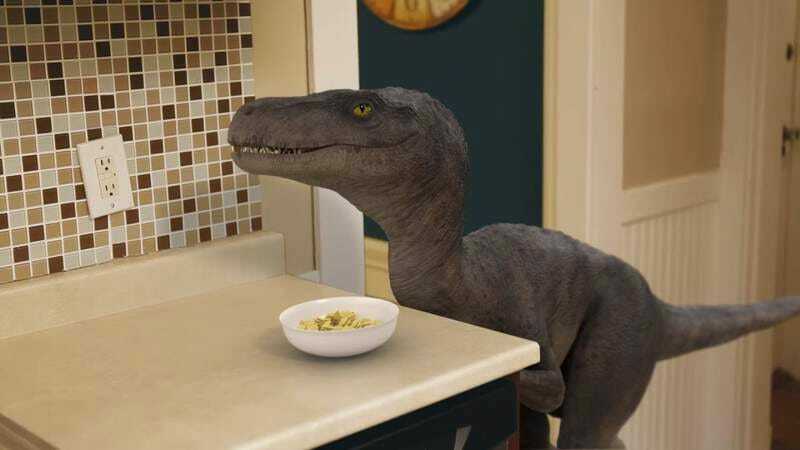 The first episode, “Breakfast,” showcases a raptor annoying his owner early in the morning with comical results. True, these raptors are patterned after the Jurassic Park types so there are no feathers, but the goal here seems to be laughs and not scientific accuracy, poindexter. There are more episodes planned, so follow the series’ Twitter account for future updates.